Geetha Arts is the prestigious banner in Tollywood running superbly on success track with hat trick hits in 2016 viz. Sarrainodu, Sreerasthu Shubhamasthu and Dhruva. is GA2 which made super hit Bhale Bhale Magadivoi. Once again, producer Bunny Vas from GA2 is coming up with new movie in Parasuram of Sreerasthu Shubhamasthu fame direction. Young hero Vijay Devarakonda who made big strides in Telugu industry with blockbuster Pelli Choopulu will be the hero.Bunny Vas is a hit producer with 100% Love, Pilla Nuvvu Leni Jeevithan and Bhale Bhale Magadivoi to credit. 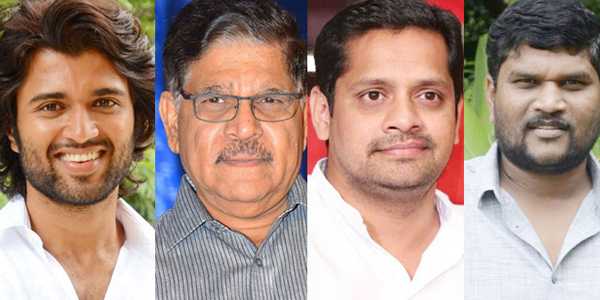 “We are delighted with hat trick hits for Allu Aravind and Geetha Arts in 2016. Parasuram of Sreerasthu Shubhamasthu narrated a good storyline and I liked it. We confirmed the project in single sitting because Parasuram earlier worked for a hit film on our banner. His vision is broader than story. We are happy to associate with Parasuram on second film. After a small gap from Bhale Bhale Magadivoi super hit, GA2 is getting ready assuring one more huge success in 2017 and beginning the shoot. Details of top technicians, huge casting will be announced soon and will go on sets very soon,” announced Bunny Vas.